The premier poet-saint of Maharashtra, Shri Jnaneshwar Maharaj, has stated that the Lord loves those who write the lives of saints; and the saints also have a peculiar method of their own of getting the service, which the devotees long for, successfully accomplished. The saints inspire the work, the devotee becomes only an indirect cause or instrument to achieve the end. For instance, in 1700 Shaka year, the poet Mahipati aspired to write the lives of saints. Saints inspired him, and got the work done; so also in 1800 Shaka year, Das Ganu’s service was accepted. The former wrote 4 works-Bhakta Vijaya, Santa Vijaya, Bhakta Leelamrit and Santa Kathamrit, while the latter wrote two - "Bhakta Leelamrit and Santa Kathamrit", in which the lives of modern Saints were described. In chapters 31,32,33 of Bhakta Leelamrit and in chapter 57 of Santa Kathamrit, the sweet life and teachings of Sai Baba are very well depicted. These have been separately published in Sai Leela Magazine, Nos. 11 and 12, Vol. 17; the readers are advised to read these chapters. So also Sai Baba’s wonderful Leelas are described in a small decent book named Shri Sainath Bhajana Mala by Mrs. Savitribai Raghunath Tendulkar of Bandra. 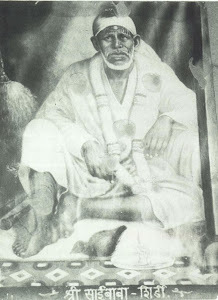 Das-Ganu Maharaj also has composed various sweet poems on Sai Baba. A devotee named Amidas Bhavani Mehta, has also published some stories of Sri Baba in Gujarathi; some Nos. of Sainath Prabha, a magazine published by Dakshina Bhiksha Sanstha of Shirdi, are also published. Then the question of objection comes in, that while so many works regarding Sai Baba are extant, why should this (Satcharita) be written? and where is its necessity? The answer is plain and simple. The life of Sai Baba is as wide and deep as the infinite ocean; and all can dive deep into the same and take out precious gems (of knowledge and Bhakti), and distribute them to the aspiring public. 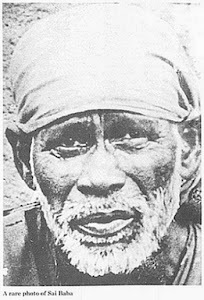 The stories, parables, and teachings of Sai Baba are very wonderful. They will give peace and happiness to the people, who are afflicted with sorrows and heavily loaded with miseries of this worldly existence, and also bestow knowledge and wisdom, both in the worldly and in spiritual domains. If these teachings of Sai Baba, which are as interesting and instructive as the Vedic lore, are listened to and meditated upon, the devotees will get, what they long for, viz., union with Brahman, mastery in eight-fold Yoga, Bliss of meditation etc. So I thought, that I should call these stories together that would be my best Upasana. This collection would be most delightful to those simple souls, whose eyes were not blessed with Sai Baba’s darshan. So, I set about collecting Sai Baba’s teachings and expressions - the outcome of His boundless and natural self-realization. It was Sai Baba, who inspired me in this matter; in fact, I surrendered my ego at His feet, and thought that my path was clear; and that He would make me quite happy here, and in the next world. I could not myself ask Sai Baba to give me permission for this work; so I requested Mr. Madhavrao Deshpande alias Shama, Sai Baba’s most intimate devotee, to speak to Him for me. He pleaded for my cause and said to Sai Baba, "This Annasaheb wishes to write Your biography, don’t say that You are a poor begging Fakir, and there is no necessity to write it, but if You agree and help him, he will write or rather, Your feet (grace) will accomplish the work. Without Your consent and blessing, nothing can be done successfully." When Sai Baba heard this request, He was moved and blessed me by giving me His Udi (sacred ashes) and placing His boon-bestowing hand on my head said :- "Let him make a collection of stories and experiences, keep notes and memos; I will help him. He is only an outward instrument. I should write Myself My autobiography and satisfy the wishes of My devotees. He should get rid of his ego, place (or surrender) it at My feet. He who acts like this in life, him I help the most. What of My life-stories? I serve him in his house in all possible ways. When his ego is completely annihilated and there is left no trace of it, I Myself shall enter into him and shall Myself write My own life. Hearing my stories and teachings will create faith in devotees’ hearts and they will easily get self - realization and Bliss; let there be no insistence on establishing one’s own view, no attempt to refute other’s opinions, no discussions of pros and cons of any subject." The word ‘discussion’ put me in mind of my promise to explain the story of my getting the title of Hemadpant and now I begin to relate the same. I was on close friendly terms with Kakasaheb Dixit and Nanasaheb Chandorkar. They pressed me to go to Shirdi and have Sai Baba’s darshana, and I promised them to do so. But something in the interval turned up, which prevented me from going to shirdi. The son of a friend of mine at Lonavala fell ill.
My friend tried all possible means, physical and spiritual, but the fever would not abate. At length he got his Guru to sit by the bed-side of his son, but this too was of no avail. Hearing this, I thought ‘what was the utility of the Guru, if he could not save my friend’s son? 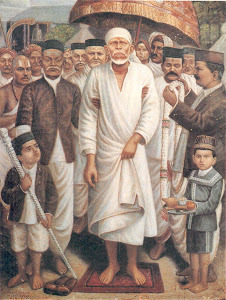 If the Guru can’t do anything for us, why should I go to Shirdi at all?’ Thinking in this way, I postponed my Shirdi-trip; but the inevitable must happen and it happened in my case as follows : - Mr. Nanasaheb Chandorkar, who was a Prant Officer, was going on tour to Bassein. From Thana he came to Dadar and was waiting for a train bound for Bassein. In the meanwhile, a Bandra Local turned up. He, sat in it and came to Bandra; and sent for me and took me to task for putting off my Shirdi trip. 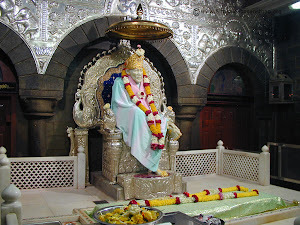 Nana’s argument for my Shirdi trip was convincing and delightful, and so I decided to start for Shirdi, the same night. 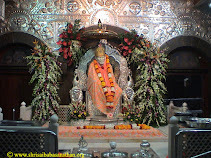 I packed up my luggage and started for Shirdi. I planned to go to Dadar and there to catch the train for Manmad, and so I booked myself for Dadar and sat in the train. While the train was to start, a Mahomedan came hastily to my compartment and seeing all my paraphernalia, asked me where I was bound to. I told him my plan. He then suggested that I should straight go to Boribunder, and not get down at Dadar, for the Manmad Mail did not get down at Dadar at all. 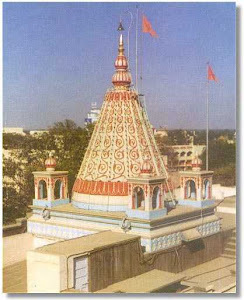 If this little miracle or Leela had not happened, I would not have reached Shirdi next day as settled, and many doubts would have assailed me. But that was not to be. 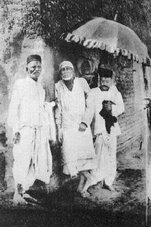 As fortune favoured me, I reached Shirdi the next day before 9 or 10 A.M. Mr. Bhausaheb (Kaka) Dixit was waiting for me there. This was in 1910 A.D., when there was only one place, viz., Sathe’s Wada for lodging pilgrim devotees. 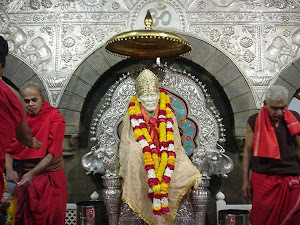 After alighting from the Tonga, I was anxious to have darshana, when the great devotee, Tatyasaheb Noolkar returned from the Masjid (Dwarkamai) and said that Sai Baba was at the corner of the Wada, and that I should first get the preliminary darshana and then, after bath, see Him at leisure. Hearing this I ran and prostrated before Sai Baba and then my joy knew no bounds. I found more than what Nana Chandorkar had told me. All my senses were satisfied and I forgot thirst and hunger. 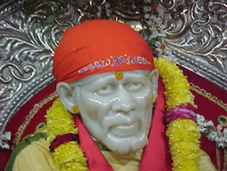 The moment I touched Sai Baba’s feet, I began a new lease of life. I felt myself much obliged to those who spurred and helped me to get the darshana; and I considered them as my real relatives, and I cannot repay their debt. I only remember them and prostrate (mentally) before them. The peculiarity of Sai Baba’s darshana, as I found it, is that by His darshana our thoughts are changed, the force of previous actions is abated and gradually non-attachment of dispassion towards worldly objects grows up. It is by the merit of actions in many past births that such darshana is got, and if only you see Sai Baba, really all the world becomes or assumes the form of Sai Baba. "What was going on in the (Sathe’s) Wada? What was the discussion about?" and staring at me, Sai Baba further added, "What did this Hemadpant say?" Hearing these words, I was much surprised. The Masjid (Dwarkamai) was at a considerable distance from Sathe’s Wada where I was staying and where the discussion was going on. How could Sai Baba know our discussion unless He be omniscient and Inner Ruler of us all? 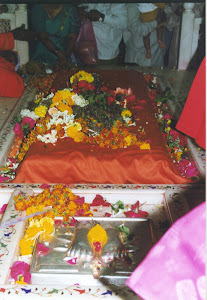 Looking to the future history, we think that Sai Baba’s word (calling Mr. Dabholkar by the name Hemadpant) was significant and prophetic, as we find that he looked after the management of Sai Sansthan very intelligently, kept nicely all the accounts and was also the author of such a good work "Sai Satcharita", which deals with such important and spiritual subjects as Jnana, Bhakti and dispassion, self-surrender and self-realisation.